VCF-74 features a dual analog highpass and lowpass filter, cascaded (series, from HP > LP). The discrete diode filter circuit is inspired by the 1970s Univox Mini-Korg synthesizer's "Traveler" filter section which provides warm, organic sound to your modular system. A stage boost switch allows you to drive the 2nd filter section (Low-Pass) with a +5.3dB signal boost from the High-Pass output signal. Independent manual resonance controls per filter section allows you to fine-tune a wide variety of focused sound. Input and Output level controls allow you to optimize dynamic range, including how hard you drive the filter--which drastically changes the dynamic interplay between signal and harmonic resonance. Both High-Pass and Low-Pass circuits have independent "offset" controls that will allow for fine tuning of each filter's cutoff. 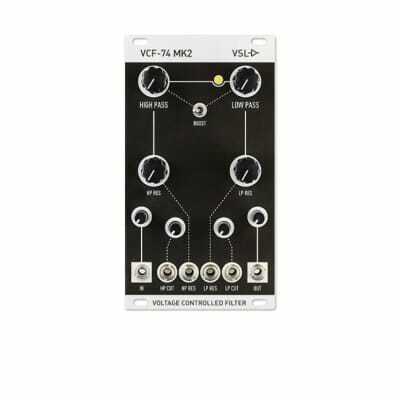 The VCF-74 can be set up as a Low-Pass, High-Pass, or Band-Pass filter. Width of the Band-Pass can be adjusted by simply dialing in the offset controls appropriately. The faceplate will look exactly the same, except the addition of "MK2" nomenclature screen printed. The audio signal path will have slightly lower frequency response as a result of component value changes. The audio signal path will now use fewer coupling capacitors (more direct-coupled circuits mean better performance, less slewing). Added calibration trim-pots for resonance control. Revised "local" power supply filtering scheme to improve PSR for the discrete (Class-A) filter stages. Added ESD protection (ESD suppressor diodes) to each front panel jack. Changed power inlet header from 16P to 10P. Widened range of Low-Pass cutoff control.